Thinly slice or chop romaine lettuce. Grate or julienne remining raw ingredients (bell peppers through cucumber). A food processor may be used to cut the vegetables. Mix cut vegetables together and place them in a colander to drain for 5-10 minutes. Layout tortilla on a clean work surface. Place ¼ cup of romaine on each tortilla. Portion 2 ounces of mixture with a #10 scoop on top of romaine lettuce. Sprinkle 2 ounces (¼ cup) of cheese on top of vegetables. 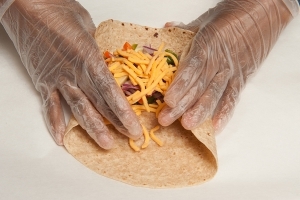 Beginning at one side, roll the tortilla until all of the contents cannot be seen. 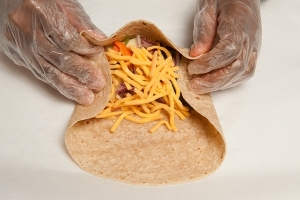 Cut wrap diagonally in half. 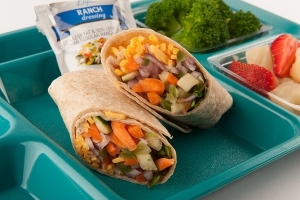 Portion 1 wrap (2 halves) with a packet of ranch dressing per serving. Each portion provides 2 oz. eq. meat/meat alternate, 1¾ oz. eq. whole grains, and 3/8 cup of other vegetable. Fold sides of tortilla over mixture. Fold top part of tortilla over folded sides of tortilla and mixture. 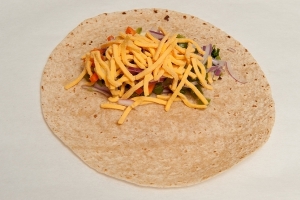 Roll folded side of tortilla until all of the contents cannot be seen.